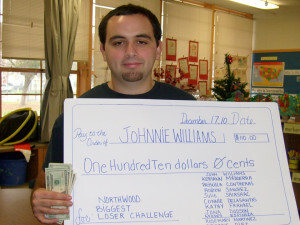 After losing 13.6 pounds, Jonnie Williams has been named Northwood Elementary’s “Biggest Loser”. In October 2010, 11 staff members from Northwood Elementary School embarked on a weight lose challenge, “Northwood’s Biggest Loser.” Each member contributed $10 towards the grand prize, a total of $110.00. Participants changed their eating habits, walked during lunch breaks and shared a weekly newsletter with recipes and inspirational poems. The challenge and weekly weigh-in brought the staff together and was a rewarding experience. The group lost a grand total of 56 pounds. The challenge ended before the winter break as Jonnie Williams was named the “Biggest Loser” with a total loss of 13.6 pounds. Staff is embarking on another “Biggest Loser” competition this month.